There are several methods recommended depending on who you talk to - using alcohol, other chemicals, or special cleaning devices. I wash them in warm soapy water. 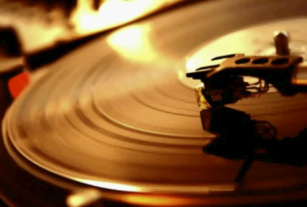 Mastering for vinyl is different to that for CD. This article explains the process, and why mixes destined for vinyl release need to be treated differently. This video made by RCA in 1956 describes the details of recording and vinyl disc manufacture. If you are new to vinyl this video covers the basics. Now that playing vinyl is becoming more popular, I think there will be lots of people who don't know what's involved in setting up a turntable with a tonearm and cartridge. There is a lot more to it than there is to playing a CD. If you are using a deck with a factory fitted arm, you can assume that things like the tonearm axis to centre spindle distance are correct. choice of cartridge. A low mass tonearm requires a high compliance cart (>20µm/mN which is 20mm/N, or 20 x 10^-6cm/dyne). A medium or high mass tonearm requires a cart compliance of <20. Generally the cart should be square-on to the record in both front and side views. Keep in mind it is the orientation of the cantilever that is most important (they are not always lined-up perfectly in the cart). If the headshell is offset, then aligning the cart parallel to it will be close to the ideal angle. If the offset is done by turning the cart a protractor is essential. I should add that many of these checks and adjustments require a very steady hand. It is quite easy to ruin a brand new stylus, scratch records etc while attempting these operations. It might be better to get someone used to doing this type of work to setup your turntable. For some further information on turntable setup click here. The Vinyl Engine has a vast amount of information on this topic too. Still at the experimental stage, but here is an article about making a record using a 3D printer. There was no standard size groove for 78rpm records. Information on the different styli required can be found here. A good animation of how a stylus operates in the record groove is here. There is plenty of discussion on forums at the moment regarding the newly released 'The Beatles' on LP. I bought the box set with the superb coffee table book. On my blog I have already commented about the pressing quality from the US supply. This was done at Rainbo Records and it is a little DEpressing that came up short at the final stage, as much care was taken with the remastering. If what I read is true, and going by my own set - most of the discs have flaws that should not be present on a collector edition such as this. After all they are pressed on 180gm 'audiophile' vinyl. Did EMI think we were going to play these only once, using a rusty nail? The main problem is high surface noise (for brand new discs), Then there are few scratches, rough lead-in /lead-out grooves, fill-in distortion, torn labels, eccentric centre holes, and unfinished edges. Rainbo obviously have quality control issues. Good on EMI for choosing this plant over several others that really do take pride in their work! Anyway, moving on to the mix. How do they compare? I ran a test of several tracks (across several albums) between the 2009 remastered versions on CD, the BC13 (the Blue Box set) and the new vinyl set. I listened to the CD set when they first came out and was impressed by the additional detail that remastering had brought out of them. I heard several tasty little details that I never know existed from hearing the analogue versions. In terms of the overall listening experience, however, such stark clarity can actual distract from simply enjoying the songs. This is especially true on headphones, part due to the split-track style of creating a stereo image that was used back in the 60s (more on this later). Although the CD box set was only remastered (not remixed), the engineers at EMI had some sophisticated tools for EQing to the point that drums or guitars could be brought out in the mix while leaving the vocals alone (the wacky stereo separation would have made this easier too). So things were brightened up, and also tightened up (with compression) to give the fresh sound that we are used to today. The BC13 sounds comparatively dull. This is to be expected, and not just because CDs always sound brighter than LPs. The other factor is how things were recorded in the 60s, which was a) in a hurry, b) in poorer acoustical environments (particularly control rooms), and c) on inferior equipment (with higher distortion). Thankfully, the Beatles were recorded at Abbey Road so more than the average amount of care was taken (for pop songs that is, which were not given the same reverence as classical recordings). The fact remains that across the Beatles repertoire there are some poorer recordings, and a certain amount of 60s blur. In enhancing the recordings for the 2009 CD release the sound is more forward, and at times this unveils the distortion (on vocals - not on the guitars!). So what's my verdict on the 2012 vinyl release (which incidentally can be bought as individual albums)? Ignoring the pressing issues, I would have to say they are the best I have heard. As the 2009 digital masters were used as a source, the sound is more like the CD version than the 1980 vinyl. The difference is that playback from vinyl softens things a little, adding its own flavour (as only LPs can). Because of the radical panning used on Beatles stereo mixes the sounds can be too discrete on CD. This is nicely taken care of thanks to the crosstalk of phono cartridges which is usually 20-25dB. Thus the clarity of the digital masters plus the analogue playback work together to form a very believable and listenable sound. Of course, when I say believable, keep in mind that as the Beatles catalogue progresses things get more artificial, so I am not talking about a soundstage in the physical sense. Now about the mono thing: All the early and mid Beatles material was not only released on mono, but a separate mono mix was performed. This in fact was the main commercial mix. Although the Beatles made all these great albums, they were also capable of producing song after song (after song...) of chart topping singles. Radio in the UK in the 60s was AM mono. As this was the way people first heard the songs it made sense to print the records in mono too. Stereo was introduced in 1958 but pickup was slow (especially in post-war UK) so many folk didn't upgrade to stereo until well into the 60s. So, the mixes that got the most time spent on them were mono. In fact the first stereo mixes were just the engineers staying late at EMI and doing their own thing. This explains why they are so experimental (with drums, bass, guitar, or even lead vocal sometimes panned hard to one side). A few songs with the mono mix were included in the BC13 set on an additional LP called Rarities. Things changed in 2009 when an optional mono box set was released as part of The Beatles CDs. I listened to them then and was impressed at how god they sounded. Without the quirky stereo (which I love too) I was able to simply appreciate how tight the band played and how great the songs are. But wait, there's more - next year EMI have promised to release the mono set on vinyl. The Beatles mixes in mono on brand new vinyl - that just might be as good as it gets. For more info on mono vs stereo click here and here.